This entry was posted on Monday, August 21st, 2017 at 3:21 pm	and is filed under AVR, how-to. You can follow any responses to this entry through the RSS 2.0 feed. You can skip to the end and leave a response. Pinging is currently not allowed. Now, A-P stimulus typically runs into the 100’s of Hertz repetitive based on stimulus time profiles (i.e., look-up time domain delays). Given the relatively low repetition rate and some need for waveform shaping, I think this application lends itself to a micro-controller running as a DDS arbitrary waveform generator (ARB). This would go far towards eliminating much of analog interface parts in this design, as well as adding enormous flexibility. 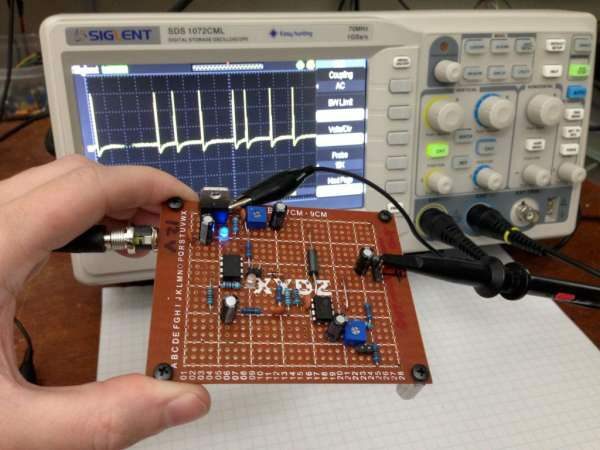 Use a simple R2R 8-bit DAC for the output. Monolithic thin-film SIP passive DAC parts are readily available and cheap. Don’t forget to add a smattering of LPF to the DAC output to suppress unwanted spurious above (roughly) the Nyquiist rate. There are plenty of examples of AVR DDS implementations out there on the Web, especially for Arduino – pick one as a starting point. I think something like the use of an 8-bit AVR part for this sort of application because there are Tons of Arduino baseline examples to start with. But when you get down to a final design, you’ll want to clock a typical AVR (e.g., ATMega328) at 20MHz and program key parts in your DDS in assembler to take advantage of the excellent clock-per-cycle efficiency (and reduced complexity) of the RISC AVR parts. This is where I suggest you depart from an IDE like a raw GCC tool-chain or (gawd forbid) the Arduino IDE and move to the free (but not open source) ATMEL Studio IDE (or whatever it’s called today) from ATMEL/Microchip. (One only wonders how long the likes of free unencumbered ATMEL IDE survives before the Greed-Heads at Microchip kill it off). There are also a bunch of dirt cheap “Function Generators” available from China on ebay etc. that have arbitrary waveform generation capability that should (theoretically) be a drop-in for this application. But as with anything from China these days – YMMV.